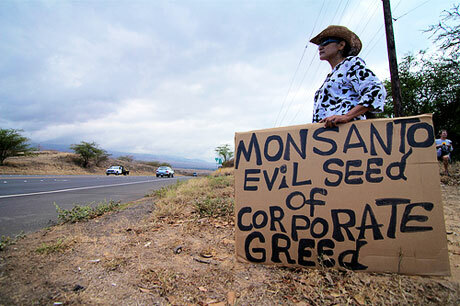 Just before the Supreme Court hears arguments in Bowman v. Monsanto Co., a new report has been released regarding Monsanto’s GE Crops and their aim for control of the global seed supply. The Center for Food Safety (CFS) and Save our Seeds (SOS) – two legal and policy organizations dedicated to promoting safe, sustainable food and farming systems – have launched their new report, Seed Giants vs. U.S. Farmers. The new report investigates how the current seed patent regime has led to a radical shift to consolidation and control of global seed supply and how these patents have abetted corporations, such as Monsanto, to sue U.S. farmers for alleged seed patent infringement. Seed Giants vs. U.S. Farmers also examines broader socio-economic consequences of the present patent system including links to loss of seed innovation, rising seed prices, reduction of independent scientific inquiry, and environmental issues. As of January 2013, Monsanto, alleging seed patent infringement, had filed 144 lawsuits involving 410 farmers and 56 small farm businesses in at least 27 different states. Today, three corporations control 53 percent of the global commercial seed market. Seed consolidation has led to market control resulting in dramatic increases in the price of seeds. From 1995-2011, the average cost to plant one acre of soybeans has risen 325 percent; for cotton prices spiked 516 percent and corn seed prices are up by 259 percent. Additionally, Seed Giants vs. U.S. Farmers reports a precipitous drop in seed diversity that has been cultivated for millennia. As the report notes: 86% of corn, 88% of cotton, and 93% of soybeans farmed in the U.S. are now genetically-engineered (GE) varieties, making the option of farming non-GE crops increasingly difficult. While agrichemical corporations also claim that their patented seeds are leading to environmental improvements, the report notes that upward of 26 percent more chemicals per acre were used on GE crops than on non-GE crops, according to USDA data. Further, in response to an epidemic of weed resistance to glyphosate, the primary herbicide used on GE crops, Dow AgroSciences is seeking USDA approval of “next generation” corn and soybeans resistant to 2,4-D, an active ingredient in Agent Orange. Monsanto is seeking approval for GE dicamba-resistant soybeans, corn, and cotton. In December of 2012, the Center for Food Safety, and Save Our Seeds submitted an amicus brief to the Supreme Court on behalf of Mr. Bowman, which supports the right of farmers to re-plant saved seed. Arguments in the case are scheduled for February 19th.